Andrew Leach, Manfredo Tafuri Choosing History (2007), pp. 122-23. What "preconcieved idea of what the future should hold" does today's (operative) architectural 'history' espouse? I like your answers, but they imply operative architectural practices more than operative architectural history, or, perhaps more precisely, architectural practice as operative architectural history. 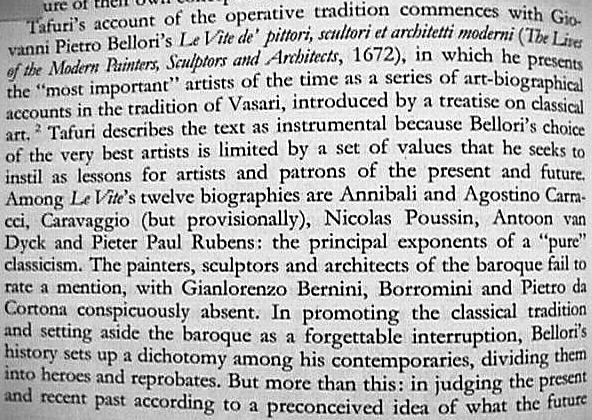 That's interesting, in that the architect acts as both practitioner and operative historian. I'm not sure how Tafuri relates to that (because I have to read further to understand more fully the whole operative criticism idea anyway), but your answers sure seem to put a contemporary twist on the subject. What I'm still not sure of is whether the two 'practices' you (critically) describe are the same as the type of practice/project that Tafuri feels architects should be involved in. It sounds like they are. In any case, your answers offer perfect examples to use in figuring out this whole operative/non-operative criticism/project issue. Plus, your answers provide a very good examples of non-operative criticism. Thus another question: Will the future held forth by today's (operative) architectural 'history' indeed be the future? I know where my uncertainty comes from. 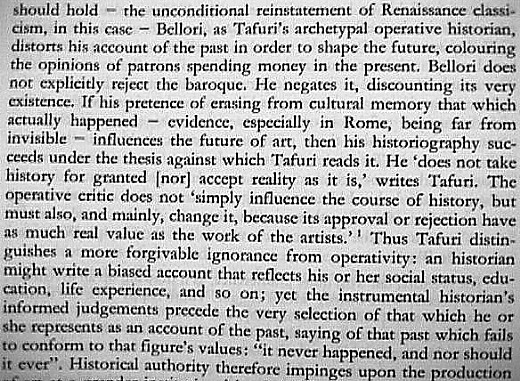 Tafuri's argument against operative criticism is against architectural historians that (operatively) used history (incorrectly according to Tafuri) to set a (correct according to the historians) agenda for architecture's future. Your two answers have architects utilizing current operative socio-political 'histories' (not operative architectural histories) to form their respective agendas for architecture's present/future. That's not to say your answers are thus incorrect, just that there is a slight disconnect between your answers and where my question(s) came from. Tafuri ultimately becomes clear as to how architectural historians should utilize history (the past) in their criticism of architecture's present/future, but he does not come to the same clarity as to how architects should utilize history (the past) in their architectural projects. Koolhaas's and Schmacher's texts do comprise fairly pervasive (architectural)historiographic currents, so their respective architectural projects are not completely rely on (outside) socio-political operative histories. Regarding sustainability/localization/critical regionalism it seems that those "projects" would naturally benefit from a critical focus on architecture's history (the past). I agree that both "an operative utilization of architectural history as well as socio-cultural one" is present within the respective Koolhaas/OMA and Schumacher/ZHA 'projects'. Like I said in the beginning, I agree with your original answers, and I subsequently (oddly just I woke up this morning) came to realize how it was the "operative utilization of architectural history" that was missing. Anyway, between our last two posts the architectural and socio-cultural are now comfortably combined. Regarding Gehry, like you're now seeing the Seattle Library as critical regionalism (which sounds quite fine to me), I'm now interested in searching out "an operative utilization of architectural history" in his work. Gehry's early work does indeed comprise critcal regionalism. And there's something about the initial designs (early 1990s) of the Disney Concert Hall's swooping forms/shapes first being concieved as stone that (I think perhaps) offers a key to the evolutionary unravelling of Gehry's operative utilization of architectural history. (These are very preliminary thoughts, and definitely nothing concrete). Just to say it, I'm not here for a polemic; I'm enjoying the group think.